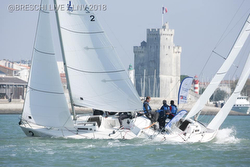 (La Rochelle, France)- Three and a half months after the first stage in Brest, the eighteen sailing clubs gathered in La Rochelle for the 3rd edition of the French National Sailing League, sailing in a fleet of matched J/80 one-design class sailboats. 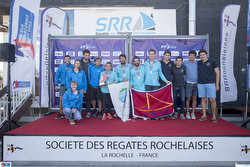 Host for the regatta was the Société des Régates Rochelaises. After the Brest regatta, it was the APCC Voile Sportive Team from Nantes that was leading, just ahead of the Normans of the CV Saint Aubin Elbeuf (CVSAE). The teams were recruiting top talent to help them improve their performance, including such French sailing superstars like Kévin Péponnet (470 World Champion), Maxime Mesnil (3rd in the European Open Match-Racing Championship), and Pauline Courtois (World No. 1 in Women’s Match-Racing)! Racing started as scheduled at 12:30pm sharp in ideal conditions, with an East/ Northeast breeze of 10-15 knots and great sun. The racing took place at the foot of the Dike du Nouveau Monde Port des Minimes of La Rochelle. The Normans of CV Saint-Aubin Elbeuf (led by Cédric Chateau and Pauline Courtois) took the best start, with 3 victories in 4 contests. But, the Nantais of the APCC Voile Sportive and the Parisians of the CV Saint-Quentin were close behind in a formidable battle for the podium. As yesterday, the weather conditions were perfect, with a 15- 20 knots blowing from the northeast. The leaders from the first day- APCC Nantes, CVSAE and CVSQ took control of the day. The Nantais of the APCC sailed well in the morning, by winning this first big meeting against the CVSQ and the CVSAE. But, the Normans, led by Cédric Chateau had the answer, with 4 more victories in 5 races thereafter. It was a performance that propelled them to the top of the standings on equal points with, amazingly enough, the APCC! At home, with their Olympic duo of Mathilde de Kérangat & Kévin Péponnet, the crew of the Société des Régats Rochelaises was very consistent throughout the day, and they just behind the APCC and the CVSAE after the day’s racing. After six more races were sailed for each team on Sunday, it was clear the trio leading the regatta were not going to let up in their battle against each other. Each of the teams continued to score top three tallies, with CVSAE closing out the series with two bullets to wrap up their win in La Rochelle as well as for the overall series win on a tie-breaker over APCC Voile Sportive Nantes. 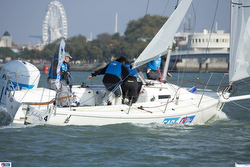 Sailing well to take third was SR Rochelaises in La Rochelle, but ended up in 4th for the overall title. CV Saint Quentin finished 4th in the regatta and, thus, took 3rd in the overall series. French Sailing League- Q&A interview of top teams (in French) For more French J/80 Sailing League information Add to Flipboard Magazine.